Astrophotographer Victor Rogus captured this view of the first-quarter moon on Jan. 18, 2013. The “terminator” divides the lunar disk into light and dark halves. When I received my first telescope as a young boy, the very first thing that I wanted to look at was the moon. I have a feeling that is pretty much the way it is with anyone who gets a telescope for a gift. I must also tell you that your first view of our natural satellite will stay with you for the rest of your life; I always enjoy "showing off" the moon to those who have never seen it up close before, as there are always exclamations of astonishment. Even binoculars are well suited for identifying the moon's major surface features. "Throughout these nights of discovery and exploration of the moon one question kept recurring to my mind. Why had I been denied all this until my school years were nearly spent? Why had it not been made a part of the growing up of every youth? I had been taught the rivers, the seas, the mountains of every continent on earth. And all this time, right above me, the 'geography' of a whole new world had been turning, page by nightly page." The moon's landscape is, of course, marked by the jagged, sharp lines of gaunt mountains, great craters and deep cracks that have probably looked the same for millions or billions of years. Mapping the face of the moon, astronomers have found lofty mountain ranges and many single peaks reaching thousands of feet above the surface. They have noted regions that appear to be dark gray and are shaped like rough circles; they are the largest features we see on the moon. Together, they cover almost half of the moon's visible surface. To early astronomers, these dark plains resembled bodies of water. That's why the Latin names they were given all start with "mare," meaning sea. (The plural of mare is "maria," pronounced MAH-ria). The major maria were named by Giovanni Riccioli in 1651 for various aspects of Earthly climate that the moon was imagined to influence, and they've stuck ever since. Then there are several hundred great clefts in the surface of the moon, resembling crooked cracks, many of them more than a mile deep and tens of miles long. But the most eye-catching features of the moon are its ring-shaped craters. Its largest ones range between 60 and 140 miles (100 and 230 kilometers) in diameter — far bigger than any craters known on Earth. In addition, the moon's surface is pocked with tiny craters too numerous to count. When you first look at the moon through binoculars or a small telescope, there will be so much to see that you may think it hopeless to try and tell one crater from another. But if you look for several nights running and have a map beside you, you will soon learn how to find your way around. The line that separates night and day is known as the terminator and is a region of changing shadows, where craters and mountain ranges stand out in stark relief. Since the position of the terminator changes noticeably, even over a period of a few hours, the appearance of the moon seems to change, too. In fact, contrary to popular belief, the absolute worst time to observe the moon is when it's full. Not only are there no shadows, but also the lunar disk appears flat and one-dimensional, and its brightness can appear almost blinding to the eye. Conversely, your very best views of the moon are during the interval running from around first quarter to a few days before full phase — a time frame that we are looking at during these next several nights. It's a good idea to make up your mind to identify three or four new craters or lunar features every night. It is, of course, best to start with the maria, which are easily recognized, even at full. And if you stay with it, you can become not only well informed about the moon but also personally acquainted with its surface features, as Leslie Peltier did a century ago; you will come to know it as a world which, in a manner of speaking, you have personally explored. These next several nights will be "prime times" for lunar viewing. Below is a night-by-night schedule for 11 p.m. Eastern Daylight Time; 8 p.m. Pacific. The moon is nearly eight days past new phase and just hours past first quarter or "half" phase (54% illuminated). Standing out on its illuminated or right side is that feature that many of us take for the left eye of the man in the moon, composed of four lunar "seas": Mare Serenitatis (Sea of Serenity), Mare Fecunditatis (Sea of Fertility), Mare Nectaris (Sea of Nectar) and, probably the most famous of all, Mare Tranquillitatis (Sea of Tranquility), an irregular dark plain 400 by 500 miles (650 by 800 km) wide where Neil Armstrong and Edwin "Buzz" Aldrin set their lunar module Eagle down on July 20, 1969. Near the moon's upper-right rim is a feature that might be considered an eyebrow, Mare Crisium (Sea of Crises). Across the upper half of the moon, you can see a rugged chain of mountains that curves diagonally to the left into the terminator, the Apennine mountain range, whose tallest crater, Mount Huygens, rises to an altitude of 17,300 feet. The moon is now 65% illuminated and a new lunar sea has been completely revealed above the center of its disk, Mare Vaporum (Sea of Vapors), while two others are partially revealed: the enormous, round Mare Imbrium (Sea of Rains) occupies the upper left part of the moon's face, perhaps marking his right eye; and down toward where we might envision a mouth is Mare Nubium (Sea of Clouds). But the most obvious feature tonight is evident right on the terminator: the so-called Monarch of the moon, the crater Copernicus. It is a lunar feature of relatively "recent" origin, having been formed by the impact of a meteoroid within the last 1.1 billion years. Measuring 58 miles (93 km) wide, a close-up view of it was obtained by Lunar Orbiter 2 in 1966, which was subsequently called the "Picture of the Century." Tonight, more than three-quarters of the moon (76%) is now in sunlight. In the far north of the moon, we can see Mare Frigoris (Sea of Cold). Tucked in between it and the northeastern shore of Mare Imbrium we see a dark, lava-filled impact crater bearing the name of the ancient Greek philosopher Plato. Farther to the south, Copernicus is now bathed in full sunlight. The crater Tycho is also becoming more prominent down toward the moon's lower limb, and it's beginning to show off its prominent ray system. More on this tomorrow night. With 85% of the moon illuminated by the sun, it now appears quite dazzling to the eye. Just outside the terminator, in the upper-left corner of the moon's gibbous disk, we can see a crescent-shaped domain of beauty: Sinus Iridum (Bay of Rainbows), considered to be one of the most delightful regions to explore with binoculars or a small telescope. What really stands out now are the ray systems surrounding Copernicus and Tycho. With some careful inspection, you will see in the case of the latter that some of these rays stretch all the way from one edge of the moon to the other. When a comet or asteroid formed Tycho, it gouged out a part of the moon some 50 miles (80 km) across, sending rocks streaking across the lunar landscape to form these rays. All craters had ray systems when they were first formed, but the loose material does not survive the billions of years of micrometeorite hits and other subtle effects that erode the surface. As you can see, compared to previous nights, the moon is now dazzling to the eye, and the shadows that made the various lunar features stand out in bold relief are now all but gone. On the evening of the 16th, just outside of the terminator, you'll see the crater Aristarchus, 25 miles (40 km) wide and deeper than the Grand Canyon. It is bright enough to be visible to the naked eye, and displays unusually bright features when viewed through a large telescope. 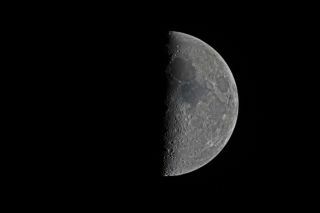 Finally, on the evening of the 18th, just hours before attaining full phase, look toward the lower left rim of the moon for Grimaldi, a large basin resembling a dimple on the moon's face. It has had a history of mysterious sightings including flashes of light, patches of color and occasional gaseous emissions. Joe Rao serves as an instructor and guest lecturer at New York's Hayden Planetarium. He writes about astronomy for Natural History magazine, the Farmers' Almanac and other publications, and he is also an on-camera meteorologist for Verizon FiOS1 News in New York's lower Hudson Valley. Follow us on Twitter @Spacedotcom and on Facebook.